I picked up the most recent copy of Hakin9 magazine this week. As usual, it delivers some good content. I first ran into Hakin9 at the local Border's Book Store when looking for Make magazine about a year ago. I usually subscribe to magazines I like, so you won't find me perusing the periodicals too often. The first issues of Hakin9 I found were a little rough around the edges. I've mentioned hakin9 in passing before, but it seems to be maturing (just a little bit). Of note, the overall grammar in the publication seems to be improved. This is partially, I'd suspect, because more writers seem to be from English-speaking countries. 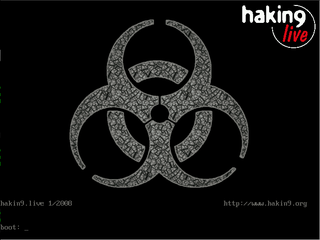 Hakin9 always comes with a CD-ROM of goodies. For the past several issues, this has been Hakin9 Live, a slightly modified release of BackTrack 2 with some extra content related to the magazine. The most recent issue of Hakin9 Live comes with two decent video tutorials, some demonstration software, and simply by way of building on BackTrack 2, a LOT of security tools ready to use if you boot a system up from the CD. Both of the video demonstrations show how to use tools right from within BackTrack. Additionally, this issue's hardcopy content is juicy. The article count is pretty low, but it makes up for it with a great level of detail, rich illustrations, and some epic profiles of big names in the industry: Gary McGraw -- who I mentioned a few weeks ago, and Eugene Kaspersky. Always rounding out the pages are overviews of the extra software included on the CD, frequent book reviews, and product reviews and recommendations. While Hakin9 obviously still carries a strong bias from the "Attack" side of things, it has enough defense-centric advice to keep it relevant to the task at hand for people in the information security biz. As such, it's never a bad thing for white hats to understand how the back hats think or what they're up to -- and we're all just various shades of grey anyways. There's obviously a verbose disclaimer about how the information within Hakin9's pages are for use on your private network and machines. We know. ;) I do think it's cool that they publish in several different languages, though.